"We can achieve world peace in one hour"
Nenad performing "Everything is Forever"
Internationally renowned Croatian musician Nenad Bach performed at the first ever Concert for Global Peace on Saturday August 29, 2009 in Kansas City, Missouri. The concert was organized by the International Visitors Council of Kansas City in collaboration with Dr. William Everett, Associate Professor of Musicology at the University of Missouri-Kansas City Conservatory of Music and Dance. Nenad was invited to headline the concert by the International Visitors Council and by Dr. Judy Vogelsang, KCIVC board member and Honorary Consul of the Republic of Croatia in Kansas City. "Can We Go Higher" - Nenad Bach (piano), Vigthor Zophoniasson (tenor), Bunny Rodina (mezzo-soprano), Richard Lindsey (bass), Don Lipovac (accordion), Matt Leifer (drums). The concert brought together and featured artists who are current as well as former students of the University of Missouri-Kansas City Conservatory of Music and Dance and who represented many parts of the globe including: Iceland, Mexico, China, the Czech Republic, Kyrgyzstan, and the United States. 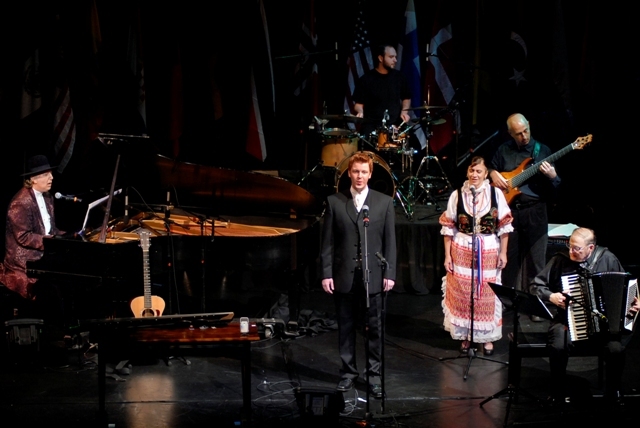 The Hrvatski Obicaj (Croatian Tradition) tamburitza ensemble from Kansas City, entertained concertgoers prior to the start of the show. Nenad Bach, Matt Leifer and Richard Lindsey performing "Time is All We Have"
A crowd of 400 plus listened as artists performed pieces from their homelands or original compositions. With the statement that world peace was achievable in one hour, Nenad Bach along with New York based bassist Richard Lindsey performed a number of Nenad's original works such as "Can we go Higher?" and a new song "Daughter's Eyes" with a several of the other artists including accordionist Don Lipovac, drummer Matt Leifer, flutist Jonathan Borja, singer Bunny Rodina and tenor Vigthor Zophoniasson. Bach received two standing ovations for his finale which included an encore performance of Festa with Hrvatski Obicaj. Nead Bach, Jonathan Borja (flute), Don Lipovac (accordion) Matt Leifer and Richard Lindsey performing "Daughter's Eyes"
For more information on Nenad Bach visit his websites at www.nenadbach.com and www.croatia.org. To learn more about the Kansas City International Visitors Council and the Hrvatski Obicaj tamburitza ensemble visit www.kcivc.org and www.kctamburasi.com respectively. World Premiere of Nenad Bach's new video "Daughter's Eyes"
Victor Zimet's film "Everything Is Forever" about Nenad Bach on Amazon! Everything Is Forever makes its New York premiere at the Jacob Burns Film Center Wed. August 27, 2014! Nenad Bach's life in America is described in a film called "Everything is Forever"
Nenad goes to Washington to witness history. Obama - Biden.